One of the key tenets of so-called superforecasting is knowing when – and when not – to make a prediction. This is a drum we beat fairly often here at Unanimous AI, and it’s the reason we demand that our weekly swarms not only register their predicted winners, but also reflect on their confidence about each game. If the swarm doesn’t register a wager-worthy amount of confidence, or reveals its conviction that no true insight is possible into a particular matchup, we relegate those picks to “High Risk” and rank the entire list accordingly. That methodology has paid off quite nicely, as we have a number of examples of high-performing swarms nailing their High Confidence picks. In fact, the NBA Swarm has hit every single High Confidence pick in the last four weeks. That is, by any measure, a remarkable display of forecasting and self-awareness for an Artificial Intelligence. But, there’s another way to demonstrate the amplified intelligence of our weekly NBA Swarm, and it’s even more simple to understand: just get every single prediction right. And that is exactly what happened last night, as the NBA Swarm’s predictions were a perfect 10 for 10. That perfect tally brings the NBA Swarm’s recent record to a red-hot 43-9 over the past few weeks. And lest anyone think this sort of thing is somehow easy to do, keep in mind that the swarm picked Golden State to win – with High Confidence – despite the Warriors missing their two best players in Steph Curry and Draymond Green, a handicap some members of the swarm were quick to point out during the session. Swarm Intelligence evolved to help simple organisms solve complex problems. Predicting an NBA game might not have life or death consequences like the challenges facing swarms of bees or flocks of birds, but they are complex and multivariable events. 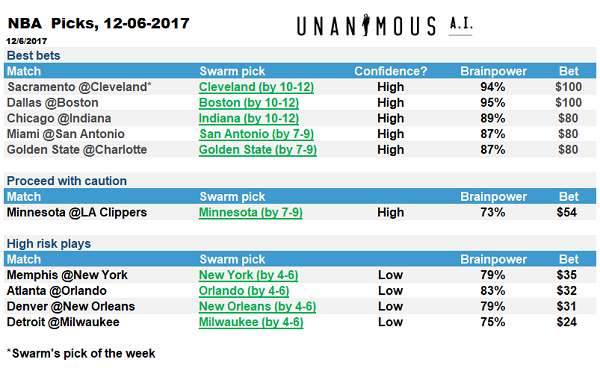 Minnesota on the road in LA, Denver over the Pelicans and the Bucks over the Pistons all represented toss-up matchups that the NBA Swarm seemed to truly wrestle with inside our Swarm AI™ platform. And, full disclosure, 10-0 would clearly have been 9-1 if not for a dramatic 17-point comeback by the Pacers to beat the Bulls.